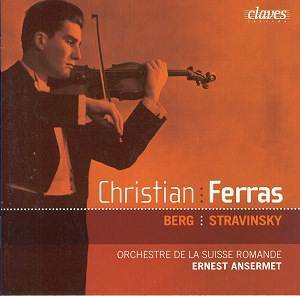 Despite a difference of fifty years between them, Ferras and Ansermet were bound by the strongest of musical ties, and most especially in the concertos on this CD. The chemistry which attracted both of them to these composers, and to each other as champions of their music, is self-evident from these passionate performances. As such this issue should be of wide interest to collectors. Nine years later, and the Stravinsky possesses a little more stereo information and range, but of course neither of these recordings are �hi-fi� by current, or even contemporary studio standards. The balance is a little better here however, and the quicksilver orchestration of the accompaniment comes across well enough. That said, this is very much Ferras�s performance. He had in 1966 only recently taken the Stravinsky piece into his repertoire, and this helps give the concerto a freshly-minted feel. His emotional expression in the third Aria II is almost impossible to bear � he manages to wring out a disturbing amount of grief which goes beyond poignancy, as if singing for every soul lost in war. This is both specialist and non-specialist terrain. Fans of Ferras will want it as a matter of course, but collectors will be hard put to find performances or recordings of either of these works which exceed this unique violinist�s expressive abilities. I take note of past criticism of his sometimes abrasive tone and fast vibrato, but find myself impressed and amazed by the variety of colour in these performances. The vibrato question is one of taste, even of fashion, and I find it perfectly natural in this setting � especially since Ferras�s intonation is superbly accurate, especially in the Berg. Despite the admitted sonic drawbacks and the brevity of the content this CD represents historical documents of a renowned artist at the top of his form in two of the best violin concerti ever written. As such it creates its own strong demands for a place in the catalogue.